Carl Sargent is best known in gaming circles for being the lead developer of Greyhawk during much of 2nd edition from 1991 to 1997. The timeline advancing From the Ashes and the unpublished Ivid the Undying are among his most ambitious works during that period. 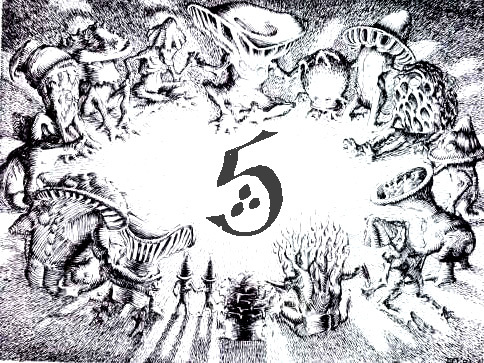 Few remember however, that before Sargent worked as a freelancer on RPGs, he had a PHD in experimental parapsychology and taught at Cambridge, where he became a published author on the subject of the paranormal. These impressive credentials must surely contributed to Sargent's quick ascension to TSR and into the fore of Greyhawk. Recently a friend of mine obtained one of his books, Explaining the Unexplained, Mysteries of the Paranormal (co-written by Hans J. Eysenck) and I must say it sheds a new light on Sargent's vision of Greyhawk. Eysenck I must add is a psychologist with over 70 books under his belt, so I assume he did a greater share of the writing. With that in mind, a large part of Sargent's contribution, being the parapsychologist was likely on the methods of testing the phenomenon of psychic abilities. The book is quite interesting, covering subjects like psychics, ESP, dreams, mind over matter, life after death and so on. "...certain environments create strong desires and wishes through incentive motivation of much subtler kinds than bribery. Human beings are extremely curious and many psychology experiments show that the simple prospect of learning how well one has done in some test or other is a powerful motivator. If the test is presented in an appealing and attention-grabbing way, curiosity becomes a powerful motivator. External factors very definitely affect how internal motivations are strengthened and expressed." "There are obvious ways in which this line of testing might be carried forward....Very relevant here are 'fantasy roleplaying' computer games, such as those based on the world best selling Dungeons and Dragons game..."
"In these games youngsters play the roles of...warriors, wizards, witches, and rogues. Confronted with deadly puzzles, riddles, and traps, and mighty enemies and monsters..."
"The games are addictive and are constructed to help...develop problem solving skills of many kinds. The powerful intrinsic motivation is that of solving riddles and puzzles." "And because the game commands intense concentration, the player would soon forget that he was being tested at all. Further, these games take place in 'worlds' (not unlike Tolkien's famour Middle Earth) in which magic exists and is real...Why should PK effects not exist too? If belief is an important factor, these games certainly aid in suspension of disbelief." I could go on, but it's evident Sargent was a good fit for developing a fantasy world. I wonder if he got tired of testing the paranormal in favor of writing RPGs (or was he combining both?). We'll never know for sure. All I know is Greyhawk was lucky to have drawn such a talented mind to the setting. The weather is colder and I'm slacking as usual. 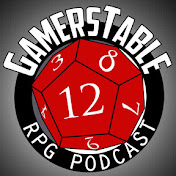 Time to plug our twenty-first episode of the Castle Greyhawk graphic novel. Follow the link to read the entire quest from the beginning plus additional written content by author Scott Casper or you read the current page compliments of Maldin's Greyhawk. Artist's commentary: This page was tricky for reasons I can't pin down. Perhaps it was the perspective of the circular stairs or the crashing through a door. You never realize how complex drawing a rectangular door is until you need it to open or be damaged. I'm still experimenting as I go with different methods of depicting light in the dark. As they are going into an old tower I'm sure I'll get a good workout of those skills. "This installment details the northern lands of the Flanaess including the Tiger Nomads, the Archbarony of Blackmoor, the Rovers of the Barrens, the Thillonrian barbarian lands of Stonefist, Fruztii, Cruski and Schnai." The GAA is an incredibly useful resource for any Greyhawk player or dungeonmaster - combining published material and even some suitable fan works into their distinct regional areas. There's many more issues to come so give it a look, you won't be disappointed. Okay folks, as promised, I have finally started reading Andre Norton's classic proto-Greyhawk novel Quag Keep (1978, published two years before the Greyhawk Folio). This topic is by no means groundbreaking. Indeed a few sources of mine have talked about it in recent memory. The Piazza forums had a thread on it last month, and before that Canonfire's forums had a discussion about locations in the novel. Then there's Grognardia's review from a few years ago which is the best overall I can find. Half way through and I'm struck by a couple things already. So yeah, without a map to reference, Norton's Greyhawk is a mish-mash of locations that were either cribbed from Gygax's notes prior to publication (and before Darlene had cemented their placement) or just plain made up for character development purposes and nothing else. But hey, no fault there that's how world building is done. There's still some good elements to work with here if one was inclined to borrow from Quag Keep for their campaigns, not to mention the classic Chaos versus Law theme is employed here. What I find interesting is how Norton approach to the novel has lent itself to many spin-offs. One the Dungeon and Dragon cartoon players were actual people from the real world who are transported to a D&D world. Many modern cartoons also involved taking kids from this world and transporting them into the games universe. Yugi oh, Beyblade, Chaotic, and many more. It seems she may have inspired this approach for future writers of fantasy Sci-Fi fiction. That's my final thought and question. If the trope works for these classics, why is it hokey when a D&D novel or cartoon does it? That's all for now, back to the book. It's been a busy a busy but fun weekend and I still need to plug the milestone twentieth episode of our Castle Greyhawk graphic novel. As usual you can read the entire tale plus additional story content on our dedicated blog through the link above or read the current page compliments of Maldin's Greyhawk. 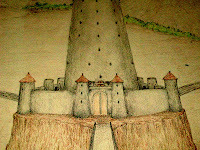 Artist's commentary: We've moved inside the castle now and the architectural nuances are still challenging. I can't wait till they get inside the keep itself though, twenty pages has been quite the journey. I often reference pictures for the slightest reasons. This time I needed to research a proper way to position the handles/straps of a kite shield in order to visually leave room for a couple torches. I think the way I found works. I apologize to any shield experts out there though. Yrag is a veteran and can craft his shield however he wants! Fresh off the heels of map-maker Anna Meyer's Ring of Five interview, I have the pleasure of introducing the start of a new map series, available for download at Canonfire, that will prove to be monstrously phenomenal in the annals of the Greyhawk cartographic community. The Greyhawk Adventurer's Atlas is the magnus opus of Braggi a long time contributor to fansites such as Canonfire and formerly Harvester's Heroes. Braggi was also recently behind the old school adaptation and expansion of my own Ull series with the Wonders of Ull Old Skool Edition. Braggi has gone to great lengths to research, map out and catalogue what he calls "one possible version of the Grand Unified Theory of the World of Greyhawk". Braggi's atlas breaks down the setting into many thematic regions each with their associated canon and fanon sources. Braggi strives to make the best setting atlas possible from all the best sources available. For this reason you will see in part one of the Atlas, dealing with the Baklunish West, that he has liberally referenced my Ull campaign articles and maps from Canonfire as a credible work alongside the base gazetteers and modules found throughout all editions. Welcome back faithful Greyhawk readers! Last time out I interviewed a pro in Chris Pramas, this time however I'm switching things up. My next victim, ahem, guest is one of hardest working fans in the Greyhawk community. 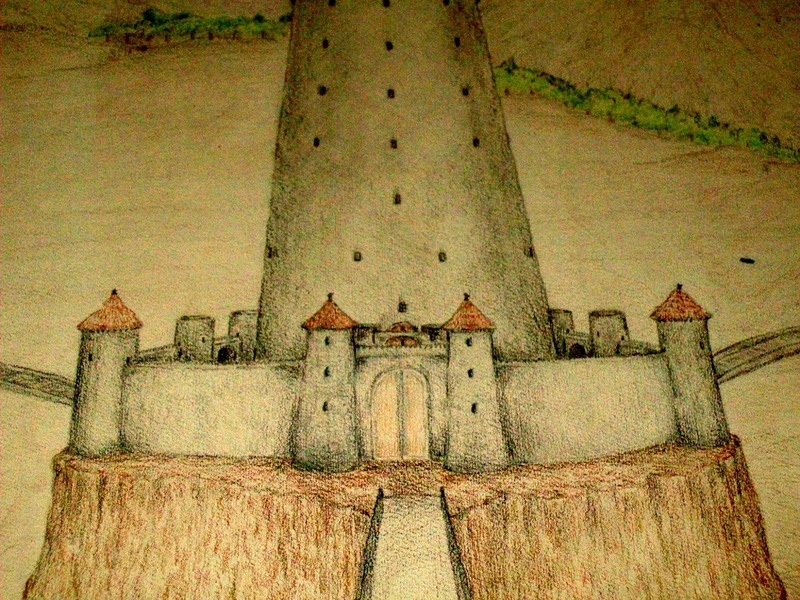 Besides actively gaming in the setting, this talented artist specializes in well researched, richly rendered Greyhawk maps. She has lent her cartographic skill to the Oerth Journal before, but her main goal is to map the entire setting and she has her own website devoted to this ambitious project - the Atlas of the Flanaess. Over the years an online following for her stunning maps has developed into a full blown social group, the Flanaess Geographical Society. We've all seen or heard about her maps, now it's time to question her about the World of Greyhawk itself. Hailing from California via Sweden, welcome to the Ring: Anna B. Meyer. Q1: You've spent countless hours staring at the Flanaess so this should be difficult. What is your favorite part of the World of Greyhawk? Anna: During my years of mapping and all the research that has come with it I've been surprised over and over again by the number of interesting, fascinating and at times spectacular places all over the Flanaess. Despite all the adventurous and famous places I have spent so much effort mapping my favorite realm is one of the least known on the continent. It has a central location and is often mentioned in many of the old modules, still it's a realm that has largely been left out of the stories of Greyhawk. My favorite part of Greyhawk is the Faerie Kingdom Celene, the elven place next to some of the most iconic paces like The Village of Hommlet and the Temple of Elemental Evil. It has majestic forests, mountains and rivers full of creatures both celestial and foul, from the smallest annoying pixie to maybe even dragons. This is where I would settle and have my own tree house if could. Q2: You've been called a mapping goddess, but if you could actually be one Greyhawk deity which one would fit you best? Anna: As a woman and an elven fan it is tempting to go for an elven deity or Mayaheine. But the one that would fit me best is probably the Oeridian goddess Johydee. Q3: I hear you have a home campaign set in the Rel Deven area. What era of the Great Kingdom do you prefer? Anna: My first campaigns were my versions of Hommlet, the Temple, the Wild Coast and the Pomarj. We played through the wars in Furyondy and Shield Lands with excursions into the Horned Lands. As a new GM I often fell into the trap of "saving the world" adventures, and the Greyhawk wars gave me a perfect chance to play that type of a campaign. The reason I chose to locate my latest campaign in Rel Deven was that I was researching the area for my mapping and I could get more out of my work by making a campaign set there in CY 598 just after the end of the Living Greyhawk campaign. For me it has turned out a lot more fun than I imagined, lots of local intrigue between good and evil and tons of references to old Greyhawk lore. I really like the mess that the implosion of the Great Kingdom cased, an area with lots of "grey" in it (pun intended). Both as a place that has a lot of Greyhawk tone to it, but also as a place with more than the usual good vs. evil struggle. Here are noble houses and historic connections, a vital part in creating more of a gray environment with even more dimensions. Q4: Anyone who has ran D&D should have a favorite villain. Who is yours, someone from canon or a creation of your own? Anna: My favorite canon villain is Lord Vuron, Grazzt's Steward. He is smart, special and intriguing, I loved to play him in some of my early campaigns. But he died at the final battle in the Gord books so I had to come up with a new favorite. This time I played it safe and invented my own, a drow cambion and Iuz half sister - Zezztra. She is the daughter of Grazzt and Eclavdra. When she grew up she was left in the care of Vuron who was very fond of her, so she grew up with kind of two fathers and later found out she had kind two mothers Eclavdra and Leda. She likes Leda despite the fact she killed Vuron. Zezztra grew to know what real affection means, a rare thing among demonkind. She hates most of her kind and that had led her to take up the profession of assassin, specializing in fiends. She work from time to time as Grazzt's elite hitman. Her alignment is neutral with some faint good tendencies, which is handy when you need to go unnoticed. She has the strength of her father, the intellect of her mentor and the charisma of her mother, in all making her a survivor even among the fittest. Her profession has taken her across the Flanaess and many other realms and she has become one of the top assassins in the known multi-verse. She wants the world to be a better place and strive to make it better, fully knowing that she will always be tainted by her heritage. She enjoys as much to see the fear in her victims eyes as the joy of the people she indirectly helps. She would like to kill Lolth, since it would be way to gain the approval of her dad, and a way to overcome her past all in one. But she needs to build her skills a bit more to be sure she can make that happen. There are lots of others to practice on in the mean time. Q5: For fun: You've been given creative control over a new edition of Greyhawk, What (if anything) would you do to the Flanaess physically or politically to shake it up? Anna: The Crook of Rao's influence had its supremacy and it's being countered and overcome, opening up for the next round of events shaking the Flanaess. I would make the next upheaval the "Return of the Overking" in the form of Duke Szeffrin rallying the Death Knights to his banner to reconquer the Great Kingdom under Rauxes again. This time in his skewed form of "pure Aerdy rule" without the Baalzy overcoat. Maybe he can rally Grenell behind his banner. What about the house Naelax and its diabolical dealings, are they defeated or will the Hells crave their lawful right? That is one area I would look into, and what I'm doing in my campaign right now. My next area of interest would be to try and work out what Iuz is up to, his ambitions can't be satisfied by any means. He wants to become a true god and increase his influence, meaning getting more to either worship or fear him. I would make him start to consolidating him power by converting parts of his realm into a demi-plane to give him more power and to be able to tweak even the physical to his needs. There will be lots of work for brave adventurers to try and stop him from literally destroying the good lands. I miss the Horned Society and its Hierarchs and their backers in the netherworld would not take defeat from an abyssal upstart like Iuz without a fight, so they might come back with a vengeance. It will give the good guys some much needed competition among the Evils. The Seldarine court will not sit on the sidelines this time and urges Celene and the elves to join the fight. Knights of Luna will start a covert battle against its foes. The same goes for the Circle of Eight, I will have them takes sides in a cold war like scramble for position and the upper hand in the power struggle. They are all in great need of brave and skilled adventurers to help them out. It's the middle of the week and time for me to catch up on a few Greyhawk related items on the net. First up is some more fiction from prolific Canonfire writer Mystic Scholar. Last time up, Mystic debuted a new story titled The Making of a Paladin. Now his main protagonist, Sir Ivon is back in a new installment called No Rest for the Wicked. If you haven't already checked out his story now's your chance to get in while it's still brewing. Enjoy! Years have passed since the crown jewels of the gnome King Warren ap'Hiller was stolen. Rumors are abundant of who did the job and why. The thieves were never caught. As fate would have it, a clue to the jewels whereabouts has landed in your hands! This 1st edition mini adventure set in the Flinty Hills is for character levels 5-7. My last piece of news is an article, this time from the old school fansite Dragonsfoot.﻿ The Stout Point of View by D.A. Howard develops this subrace of halflings in new and interesting ways. For Greyhawkian dungeonmasters and players who love hobniz, I highly recommend the cultural information and random tables presented in Mr. Howard's article. Download it and good gaming! As reported by Havard's Blackmoor Blog, the old D&D setting forum The Piazza has recently been treated to the start of a Q&A thread with World of Greyhawk map creator and classic D&D illustrator, Darlene. As an artist myself, sometimes it's not enough to look at a piece of art; I also want to know how they made it. Darlene's most recent anecdote tells of how the Greyhawk maps were assembled on her drawing table, and I must say it really puts a perspective on how relatively easy and forgiving today's computer aided art can be. Her layering technique involving acetate and Pantone color sheets is some really old school printerly stuff. I'm not even sure Pantone makes adhesive color sheets anymore. While Darlene's method of producing full color maps may have been more common back then, it still bears alot in common with today's layered computer art except as she mentions there was no room for error. Gotta love it.